People have been cooking in clay vessels for thousands of years, and this type of pot is still used and loved today. The clay pot is covered when set to cook, creating an environment that allows the heat and moisture to circulate, basically steaming the food and resulting in an evenly cooked dish that is tender and juicy. The clay material retains heat well, keeping the food warm after it comes out of the oven, eliminating the need for reheating. It is also the perfect serving dish. Clay pots (also called clay cookers) can be glazed or unglazed (or a mixture of both). If unglazed at all, the pot needs to be prepped before using; there is also a certain way to cook with a clay pot. If you have never used the pot before, you need to clean and season it before use. In order to assist in the steaming and prevent cracking, the pot needs to be soaked in water before use each time. Prior to adding in the ingredients, completely submerge both the top and bottom of the clay cooker in cold water and soak for at least 15 minutes. This is easily accomplished by filling your sink with water and putting the clay cooker in while you prepare the ingredients. Once it finishes soaking, place the recipe ingredients inside, cover, and get ready to cook. One of the most important things to remember when using a clay pot is that sudden temperature changes will crack the cooking vessel. That is why you need to place the covered clay pot into the center of a cold oven—make sure you do not preheat the oven before placing the clay cooker inside. It is necessary to the cooking process to gradually bring the pot up to the desired temperature. Since there is a risk of cracking the pot due to extreme temperature changes, you cannot use a clay cooker on the stovetop. Most clay cooker recipes call for a temperature of 400 to 480 F. Larger pots will take longer to cook, of course, but many dishes will be done within an hour. Some recipes will require you to remove the top near the end to achieve a browning or crisping effect. Clay pots are used around the world and therefore offer a wide variety of recipes stemming from all different cuisines. 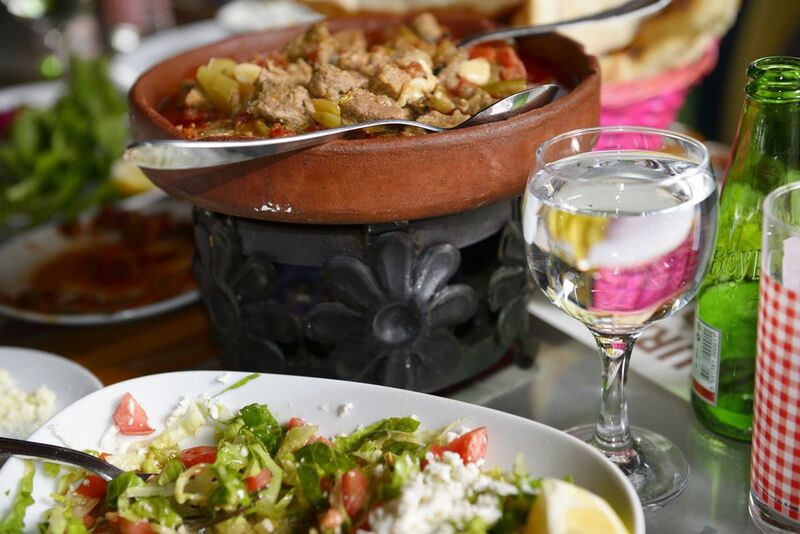 You will find many Moroccan clay pot recipes since a tagine is a type of clay pot, Asian rice dishes that are cooked in a clay pot, and bean dishes from Columbia cooked in a chamba pot. Don't be deterred by the amount of garlic in the clay pot recipe for chicken with 40 cloves of garlic—the garlic mellows as it cooks, turning nutty and sweet. This combines beautifully with the lemon and herbs, and the potatoes add a bit of heft. Turkish shrimp and vegetable casserole slowly cooks onion, garlic, tomatoes, peppers, and mushrooms along with shrimp and spices in a clay cooker to create a succulent dish. And just two of the many Moroccan tagine recipes to try are a Moroccan fish tagine (called mqualli), combining fish, spices, vegetables, and lemon, and a sweet and savory tagine of lamb and dates.